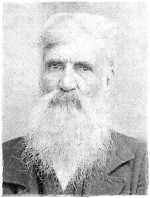 Stephen D. Williams is believed to be a son of Jeremiah Williams [1784-1864] after a Y-DNA test revealed that descendants of the two men share almost the exact same Y-DNA. Jeremiah also was listed was one unknown male born 1820-1825 and one unknown male born 1825-1830 in the 1830 Moore County, NC Census. It is my belief that Stephen D. Williams was one of those sons. Division of land of William Jones, decd. and Amelia Jones, decd. "Died - At his home in Sheffield's township on Saturday night last, of paralysis, Mr. Stephen Williams. He was the father of Mr. Wesley Williams of this town." The birth dates of several children on their tombstones/death certificates don't match the census data. For example, in the 1850 census the only children listed at William T. [2 years old] and Richard M. [1 year old]. According to their tombstones Richard M. was born 8 Apr 1848 and William T. was born 9 Nov 1848. Murdock M. was not listed in the 1850 Census and was listed as 8 years old in the 1860 Census but his death certificate and tombstone list his date of birth at 4 Mar 1847. I believe it is more likely that William T. was born in 1847/1848 and Richard M. was born 1848/1849 and Murdock M. was born in 1852. 1868 Division of Land, Moore County, NC - William Jones, decd. and Amelia Jones, decd. Jerry Williams, descendant of Jeremiah Williams [1784-1864] > Elias Terrel Williams [1830-1894] and Lee Williams, a descendant of Jeremiah > Stephen D. Williams [b.1823] match each other and much to our surprise, Allen Williams, a descendant of Thomas Williams [1786-1859] was a very close match to both of the samples. Thomas Williams had long been believed to be a son of George Williams but the Y-DNA results have called this into question. It is possible that Thomas Williams was a brother to Jeremiah and not a son to George. More research is needed to nail down this line and connection. As far as other Williams connections, Jerry and Allen's Y-DNA are close matches to a number of Williams men believed to have descended from Robert Williams [d.1772 Bute County, NC (current Warren County)]. Based on the closeness of the match, it is possible that Jeremiah and Thomas were grandchildren or great-grandchildren of Robert or a brother or cousin of Robert's.